With borrowed waders snugly clamped to my legs, I trudged along into a strong head wind along the shores of the Mighty Mississippi. Early January in Minnesota is a great time to fish for smallmouth...right? Right. Rocks. I slipped on rocks. I lost a newly purchased finesse jig on a rock. And I caught a few fearsome smallmouth bass off of these rocks. I love rocks. I was very fortunate this day to get out with a friend and fellow BASS Member, Dan, for a morning of great bass fishing. I sought Dan's guidance, as he has spent much more time than me on this stretch of river. I stepped where he stepped, nearly made casts to where he cast, and tried to follow suit with the tackle I was using. My personal gear consisted of a 6'6" spinning rod and reel with 6 lb Seaguar fluorocarbon. As I mentioned, I was casting a 1/8th finesse jig with a round head with a 3" Strike King Rodent trailer. It seemed I was snagging less than Dan with a round jig versus his football head jig. After I lost this finesse jig to a hungry rock, I dabbled with a tube jig and I was snagged up almost every cast. Our presentation was very basic. Cast and let the jig bounce along the rocks with the current. We had to constantly pop our jig while it was rolling along to hop, skip and jump between and off the rocks. The smallmouth bit very light on a few occasions, and I was fooled a few times thinking I caught a rock until it was trying to shake its way free.The fights were tough, a mix of smallie genetics and a constant current. Awesome. 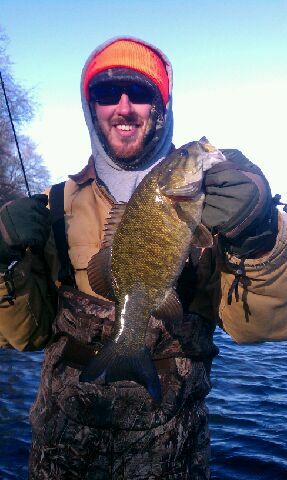 My largest fish of the day was about 3.5 pounds on the smallmouth, thumpin' richter scale. Dan caught a nice 19" bass that we estimated to be around 4 pounds. It was great to catch bass with open water fishing tackle as floating chunks of ice cruised down the middle of the river and the shores were lined with a layer of snow. Just think, the week before I was fishing on 14" of ice on Lake of the Woods. Minnesota can be awesome. Carl Spande is a lifelong fisherman and avid outdoorsman. He has been participating in local competitive bass tournaments for the past three years. Rod Slicks: Start Using Your Rod Locker Again! A "slick" way to protect and organize your fishing rods. Golden Rod of Thumb: Don't fall victim to species specific labels on your fishing gear! Is there a lure or presentation that you won't use because it is too "cliche"? In need for open water smallmouth fishing? Head to the Mississippi River to cure your winter blues. Presentations to try while fishing for Bass during the spawn.